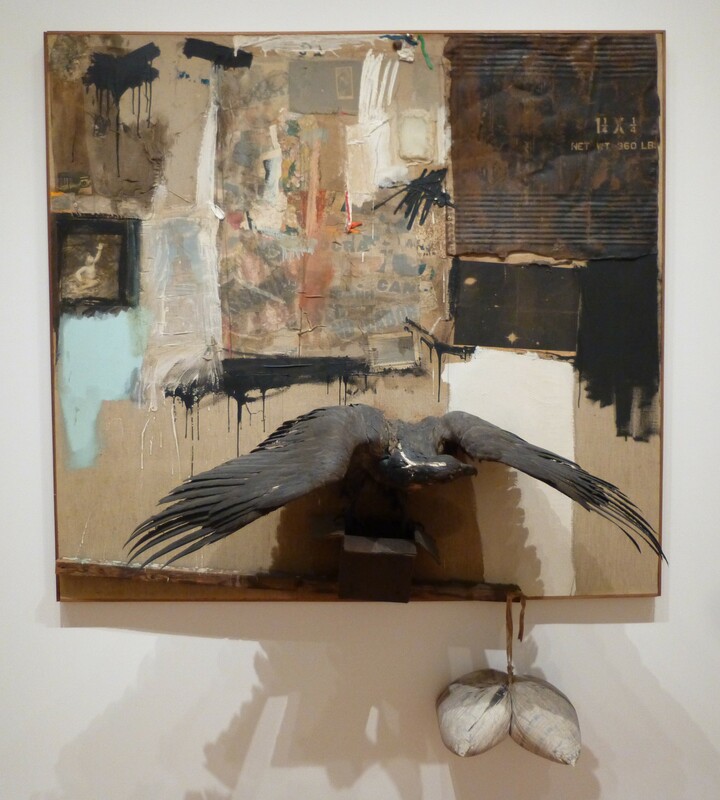 Canyon is one of Robert Rauschenberg’s Combines (also called Combine Paintings), which were hybrid works incorporating painting, collage, and found objects that he began making in 1954. Rauschenberg often kept an eye out for curious items in the street while walking around downtown New York, later repurposing “whatever the day would lay out” for his artistic ends. The centerpiece of Canyon is a stuffed bald eagle that was found in a pile of discarded belongings in the hallway of the Carnegie Hall studio building and given to Rauschenberg by fellow artist Sari Dienes. It juts out from a canvas that is covered with pieces of a collared shirt, floral fabric, a photograph of Rauschenberg’s young son, a flattened metal drum, and a wrung–out tube of oil paint, among many other items. Canyon is part of the permanent collection of the Museum of Modern Art in NYC and can be seen in the Painting and Sculpture II, Gallery 18, 4th Floor.